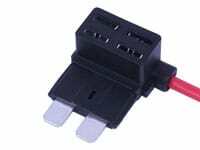 The Add-A-Circuit Fuse Holder essentially taps directly into a wire running from the battery to the fuse block. The amperage would be controlled by the number of leds you are using and the fuse to correspond with this. Not sure to be honest. It depends how your car is wired. Probably the regular. You can look at your fuses to be sure. It just plugs into your fuse box. Not really. You can return them if needed. There seems to be very little technical data on these add-a-circuits from the manufacturers to aid in proper use. Perhaps you can clear something up for me. Fuses are intended to protect the wire from excessive current draw, correct? I've always been told: load < 80% of fuse rating and fuse rating < 80% of wire gauge limit. So, let's assume our source is a 10 amp fuse and we're connecting a device, via the add-a-circuit, that draws 4 amps. I would always retain the original (in this case, 10 amp) fuse and use a 5 amp fuse for the new device (80% of 5 amps is 4). Here's where I get confused. When selecting an appropriate source location, should the combined amperage of the the original and add-on device never exceed the amperage of the source circuit? Or does the add-a-circuit act independently of the source (up to a 10 amp max, I'm told)? Hopefully my question makes sense. The add-a-circuit acts independently of the source. There's a giant wire (maybe 4 gauge) running from the battery to the fuse block, and the Add-A-Circuit Fuse Holder essentially taps directly into this. When adding in the new fuse, do you correspond the number of amps on the new fuse to the light you are working on? And you wouldn't have to change the old fuse out to a different amp, correct? Yes to the first question. Correct to the second question. It depends how much current your LEDs draw. A few amps should be fine though.